A freezing method invented by Norio Owada seems to work very well indeed on things that don't freeze well. Like ice cream, apples - and possibly human organs. It works like a microwave oven but in reverse. Inside the freezer the object being frozen is zapped with a strong magnetic field and, Owada says, other kinds of energy. The field keeps the cream or beef's water molecules swirling in liquid form even as their temperature plummets. When the field is switched off, the object is instantly frozen, without time for the formation of ice crystals. These crystals normally rip apart organic cells, which degrades the texture and taste of food. Forty-seven researchers are now working with Owada's method to see if this technology can be used to preserve human organs. Mouse hearts, nerve fibers, even teeth, are being preserved and then thawed and tested. Owada believes that the first defrosted transplant could occur in humans within ten years. 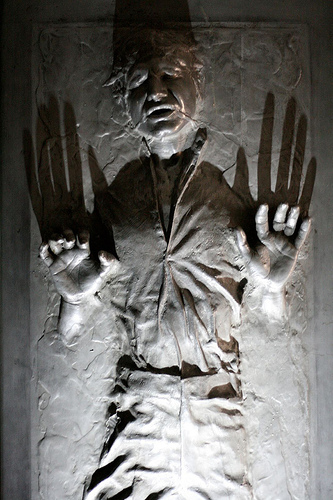 SF fans have been long familiar with the idea of a corpsicle; Star Wars fans of course recall carbonite freezing. Molten carbonite is flash-frozen into a solid state, encasing materials for transport in an incredibly strong metal alloy. Carbonite has the ability to suspend organic matter in a form of stasis. Under the correct settings, a living form can be carbon-frozen and placed into hibernation. The process is exacting and extremely dangerous -- a miscalculation can result in death. Via Forbes and the Star Wars databank; thanks to J for the tip on this story.